This week the guys over at PETA (The People for the Ethical Treatment of Animals) Foundation awarded our vegan selection the epic title of “Best Vegan Doughnut” in the PETA Vegan Food Awards! To celebrate we’re offering a free hot or iced drink in our vegan Marylebone store, with any 6 or 12-pack purchase, from Friday – Sunday this week! In 2017 we set ourselves an ambitious objective: To create a vegan doughnut every bit as delicious as any other doughnut we make. Initially launching with limited flavours, only available at weekends, we were blown away with the response. Since then we’ve opened three completely vegan locations, serving up 9 lip-smacking flavours all made with select plant-based ingredients – sourced locally and from around the world. As scratch bakers we’re proud to produce everything in-house in London. Our sourdough has been given a vegan rework, using chia seeds and coconut butter to create our signature bread-like texture, whilst a varying combination of oat milk, coconut butter, dairy-free dark chocolate and silken tofu goes into the vegan fillings and glazes. 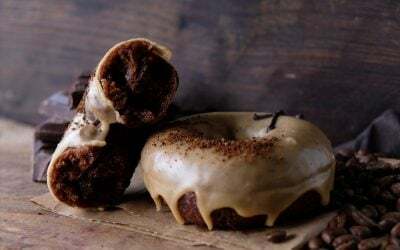 The vegan selection includes all the crowd favourites like Chocolate Truffle and Vanilla Glaze, plus a rotating seasonal selection such as Lychee & Gooseberry, Orange Blossom and Coconut & Lime. 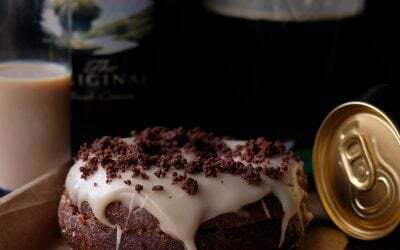 Alongside our vegan doughnuts, we’re proud to offer our a full range of plant-based drinks, including Caravan speciality coffee served with Minor Figures ‘milks’. Head in to our Marylebone store this Friday, Saturday or Sunday, grab yourself a 6 or 12-pack and have a coffee on us.